Pronunciation:le-vo-thy-rox-ine sodium Classification:​ ​thyroid IFU:​ ​hypothyroidism Route: by injection or orally Dosa​ge: 25 mcg, 50 mcg, 75 mcg, 88 mcg, 100 mcg, 112 mcg, 125 mcg Action​: replaces endogenous thyroxine and increasing thyroid hormone levels. Adverse​ ​Reaction: Chest pain or discomfort, decrease urine output, difficulty breathing, etc. Interactions: acarbose, benzphetamine, canagliflozin, dopamine, etc. Travatan​(travoprost) Pronunciation:Tra-vo-pr-st Classification:​ ​ prostaglandin analogue IFU:​ ​glaucoma Route:Drops Dosage: 0.04 mg/ml Action​: replaces endogenous thyroxine, increasing thyroid hormone levels. Adverse​ ​Reaction: blood in urine, chest pain, cough producing mucus, headache, etc. Interactions: bimatoprost topical, latisse, macular edema, uveitis, etc. Xalatan​(latanoprost) Pronunciation:la-tan-o-prost Classification:​ ​prostaglandin analogue IFU:​ ​glaucoma Route: drops Dosage: 50 mcg/ml Action:​ reduction of elevated intraocular pressure in patients with open-angle glaucoma or ocular hypertension. Adverse​ ​Reaction: eyelid crusting, redness, swelling, discomfort, or pain. Interactions: Bimatoprost ophthalmic, latisse, lumigan, bimatoprost topical, etc. 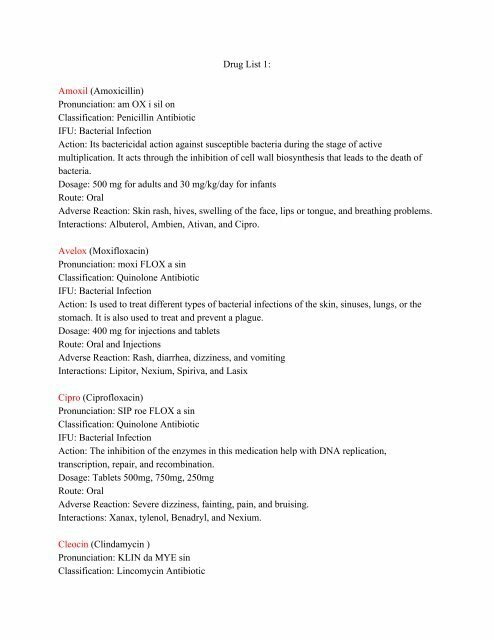 ______________________________________________________________________________ Drug List 9: AcipHex ​(RABEprazole) Pronunciation: ​ ​ra·bep·ra·zole Classification: ​PPI (Proton-Pump Inhibitor) ​ IFU:​ GERD (Gastroesophageal reflux disease aka Acid Reflux) Route: Oral Dosage: ​20 mg ; 5 mg ; 10 mg Action: ​Decreases the amount of acid produced in the stomach. Adverse​ ​Reaction: Bad, unusual, or unpleasant (after) taste, change in taste, & ​c​ough or hoarseness Interactions: atazanavir, clopidogrel, dasatinib, & erlotinib Ciprodex ​(ciprofloxacin/ dexamethasone) Pronunciation: ​cip·ro·flox·a·cin / ​ ​dexa·meth·a·sone Classification: Quinolone/ corticosteroid IFU:​ Bacterial external ear infection Route: ​Suspension (Otic: Ear drops) Dosage: ​0.3%-0.1% Action: Cough, difficulty with swallowing,dizziness, & fast heartbeat Adverse​ ​Reaction: ​an antibiotic that treats infections caused by bacteria. Dexamethasone is a steroid. It reduces the actions of chemicals in the body that cause inflammation. Interactions: Un-known NexIUM ​(esomeprazole) Pronunciation: ​es·omep·ra·zole Classification:​ PPI (Proton-Pump Inhibitor) IFU: GERD (​Gastroesophageal reflux disease aka Acid Reflux) Route: Oral & Intravenous powder Dosage: 20 mg ; 40 mg ; 10 mg ; 2.5 mg ; 5 mg ; 24.65 mg ; 49.3 mg Action: Short-term treatment of gastroesophageal reflux disease (GERD) in patients with irritation and swelling of the esophagus when medicine cannot be taken by mouth. Adverse​ ​Reaction: ​Bad, unusual, or unpleasant (after) taste & change in taste Interactions: sofosbuvir / velpatasvir, rilpivirine, pazopanib, & nelfinavir PepcidGastro ​(famotidine) Pronunciation:​ ​fa·mo·ti·dine Classification: H2 Blocker IFU:​ GERD (Gastroesophageal reflux disease aka Acid Reflux) Route: ​oral powder for suspension, oral tablet, oral tablet chewable, oral tablet disintegrating Dosage: ​20 mg ; 40 mg ; 20 mg/50 mL ; 40 mg/5 mL ; 10 mg/mL ; 10 mg ; 20 mg/10 mL-NaCl 0.9% ; 20 mg/5 mL-NaCl 0.9% Action: ​decreasing the amount of acid the stomach produces. Treat and prevent ulcers in the stomach and intestines. Page 17 and 18: Dosage: prefilled syringes- 30mg/0.